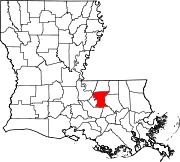 East Baton Rouge Parish (French: Paroisse de Bâton-Rouge Est, Spanish: Parroquia de East Baton Rouge) is the most populous parish in the U.S. state of Louisiana. As of the 2010 census, the population was 440,171. The parish seat is Baton Rouge, Louisiana's state capital. East Baton Rouge Parish is located inside of the Baton Rouge, LA Metropolitan Statistical Area. According to the U.S. Census Bureau, the parish has a total area of 470 square miles (1,200 km2), of which 455 square miles (1,180 km2) is land and 15 square miles (39 km2) (3.2%) is water. The City of Baton Rouge and the Parish of East Baton Rouge have been run by a consolidated government since 1947, which combined the City of Baton Rouge government with the rural areas of the parish. The city and parish are served by the Metropolitan Council and the Mayor-President. BRgov.com is the official government website for the City of Baton Rouge and the Parish of East Baton Rouge. The parish courthouse in Baton Rouge is one of twenty-six public buildings constructed by the contractor George A. Caldwell In the 1930s. In 2010, the 19th Judicial District Court moved into the new courthouse on North Blvd. The Jetson Center for Youth, a former juvenile prison operated by the Louisiana Office of Juvenile Justice, is located near Baker in an unincorporated area. As of the 2010 census, there were over 440,000 residents in East Baton Rouge, making it the largest parish in Louisiana. There are 156,365 households and 102,575 families residing in the parish. The population density was 906 people per square mile (350/km²). There were 169,073 housing units at an average density of 371 per square mile (143/km²). The racial makeup of the parish was 49.5% White, 45.9% Black or African American, 0.3% Native American, 3.0% Asian, 0.12% Pacific Islander, 1.02% from other races, and 1.2% from two or more races. 3.8% of the population were Hispanic or Latino of any race. There were 156,365 households, of which 32.80% include children under the age of 18. 44.70% were married couples living together, 16.80% had a female householder with no husband present, and 34.40% were non-families. 26.90% of all households were made up of individuals and 7.20% had someone living alone who was 65 years of age or older. The average household size was 2.55 and the average family size was 3.14. In the parish the population was spread out with 26.20% under the age of 18, 14.40% aged 18 to 24, 28.70% from 25 to 44, 20.80% from 45 to 64, and 9.90% who were 65 years of age or older. The median age was 32 years old. For every 100 females, there were 91.90 males. For every 100 females age 18 and over, there were 87.50 males. The median income for a parish household was $37,224, and the median income for a family was $47,480. Males had a median income of $38,334 versus $25,073 for females. The per capita income for the parish was $19,790. About 13.20% of families and 17.90% of the population were below the poverty line, including 22.70% of those under age 18 and 11.50% of those age 65 or over. East Baton Rouge Parish has both the highest high school graduation rate, at 82.2%, and the highest percentage of residents holding at least a bachelor's degree, 33.3%, in the state of Louisiana. Since 1980, East Baton Rouge Parish has been a bellwether in presidential elections, voting for the winner of the presidency in all but two elections (it voted for George H.W. Bush in 1992 and Hillary Clinton in 2016), but not necessarily the winner of Louisiana. In the 2008 presidential election, the parish voted for Democrat Barack Obama, who won 51% of the vote and 99,652 votes. Republican John McCain won 48% of the votes and 95,390 votes. In the 2008 Senate election, Democrat Mary Landrieu, who kept her seat as a U.S Senator, won 57% of the vote and 110,694 votes in East Baton Rouge Parish. Republican John Neely Kennedy won 41% of the vote and 80,222 votes. In the 2004 presidential election, East Baton Rouge Parish cast the majority of its votes for Republican George W. Bush, who won 54% of the votes and 99,943 votes. Democrat John F. Kerry won 45% of the votes and 82,298 votes. In 2016, John Kennedy lost East Baton Rouge Parish in his otherwise highly successful U.S. Senate race against the Democratic Louisiana Public Service Commissioner Foster Campbell, who prevailed 52-48 percent. By a nearly identical margin, Democrat Sharon Weston Broome defeated the Republican Bodi White to claim the Baton Rouge Mayor-President position to succeed Democrat Kip Holden. Sections of the parish not in Baker, Zachary, or the City of Central are zoned to schools in East Baton Rouge Parish School System. Baker residents attend the City of Baker School System. Zachary residents attend the Zachary Community School Board. Central residents attend the Central Community School System schools. The 769th Engineer Battalion (Combat) a unit of the 225th Engineer Brigade is located in East Baton Rouge Parish. Two companies of this battalion deployed to Iraq in 2007-2008. Another company sized unit, the 927TH Sapper Company deployed to Afghanistan in 2008-2009. As of 2011 yet another company, the 926TH MAC (Mobility Augmentation Company) located in Baker, Louisiana has been alerted for overseas deployment. The 769th Engineers has two other companies, the 922nd Horizontal Engineer Company located in Gonzales, Louisiana and the 928th Sapper Company located in Napoleonville, Louisiana. ^ "Jetson Center for Youth." Office of Juvenile Justice. Retrieved on June 30, 2010. "15200 Old Scenic Highway (at US Hwy 61) Baker, LA 70714 (physical address) "
^ "2004 Presidential General Election Results - Louisiana (East Baton Rouge Parish)". David Leip. Retrieved 2018-03-08. ^ "Election Results". December 10, 2016. Retrieved December 16, 2016. ^ "» Zachary Community Schools". www.zacharyschools.org. Retrieved 2018-03-08. This page was last edited on 25 March 2019, at 21:20 (UTC).